Ditch the measuring cup—this is a measuring container. Dry goods (like nuts, cereal, or rice) store safely in the airtight vessel, while the cap measures and dispenses up to ½ cup, without spilling the rest. Take Made with you to the bulk aisle and cut down on disposable bags. The design accommodates those large scoops, but is still slim enough to fit in one hand. I only bought one size and cooking for just myself, I found this very handy! This is just the device I needed for my daily measuring out of breakfast topping (trail mix). Love it. This could be a real boon for dieters. Don't use for measuring but like for storage. Use one for my coffee. We purchase rice in large bulk bags, and this is the perfect size for keeping a smaller supply of rice handy. Product makes it handy for measuring out product! No need for a measuring cup when you have a measuring container. 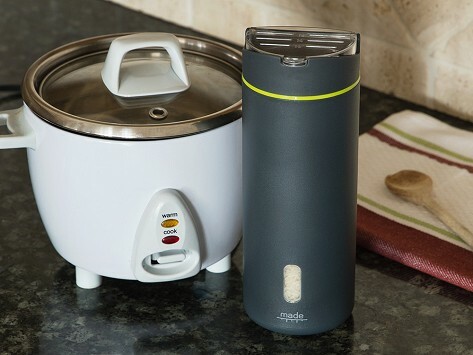 Made measures, dispenses, and stores dry goods all in one handy vessel. In fact, "Made" stands for "Measure And Dispense Easily." The unique design holds dry ingredients in a slim, air-tight canister, while the lid doubles as a measuring cup and dispenser. Gently tilt and shake until the right amount of dry goods is in the lid—you can see the amount against the measurement lines. Lift the cap to dispense what you want, while the remaining dry goods stay put. Founder CJ Knapp created Made after he couldn’t measure and mix baby formula—while holding his baby daughter—in the middle of the night. His design makes storing and serving easy. 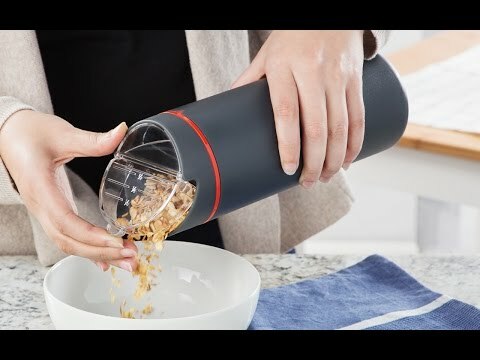 It’s perfect for measuring things that don’t need to be precise—like cereal, oats, nuts, rice, or granola. And it’s good for portion control, too. The shape accommodates the large scoops for bulk dry goods while fitting in one hand, eliminating the need for disposable bags. Use several to store different dry goods—colored bands help identify what’s inside—and turn your pantry into a well-organized space.